Looking forward to head over to Lameroo in South Australia on Feb 7, to be involved in the End of Harvest Community Celebration supporting this proud rural community through the good and bad times. The event has been put together to ‘tackle tough times together’ during the drought by helping to lift the stigma on mental health in rural communities and help connect farmers and the community with support networks and local service providers. 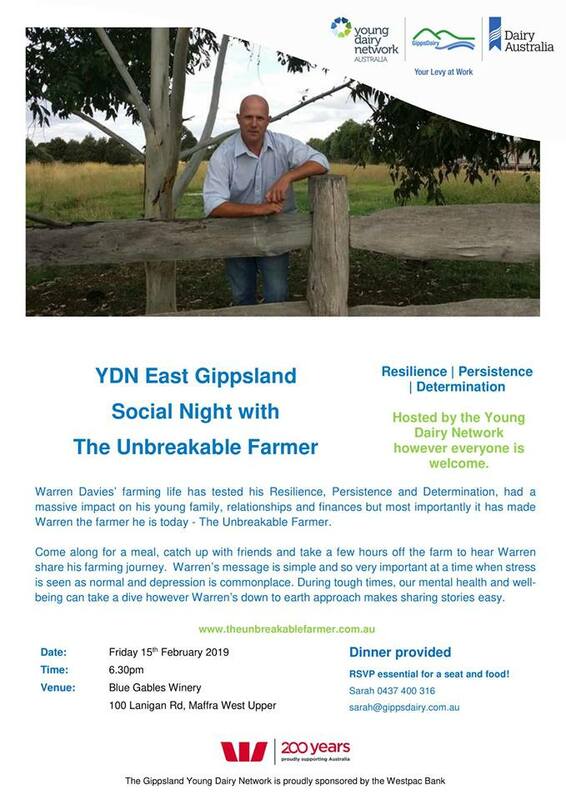 YDN Gippsland social night at Blue Gables winery with The Unbreakable Farmer 15th Feb 6.30pm. See attached flyer and see you there! If resilience, persistence, determination, leadership and well-being are topics that interest you, then Warren Davies (The Unbreakable Farmer) should provide you with plenty of food for thought. His message is simple and so very important at a time when stress is seen as normal and depression is commonplace. Warren will change the thinking and behaviour of your most precious resource – you and your people. There are three opportunities to engage with Warren, so please contact GippsDairy on 5624 3900 or info@gippsdairy.com.au if you are able to come along to one of these events. Resilience, Persistence, and Determination are the words to describe Warren Davies also he is a husband, father of 5, son, brother, mate, and normal bloke down the road. His keynote topics are centred on resilience, persistence, determination, leadership and wellbeing, their moral relevant to all ages and communities. Warren’s ability to engage with individuals or organisations is through the journey of him piecing back together his life and the life lessons he learned along the way. His down to earth approach makes his story and strategies relevant whether you are from the country or the city, a farmer or the CEO of a large corporation. Warren’s authentic, inspiring and sometimes confronting presentations are filled with take home strategies developed from his business and life journey, that his audience can implement in their day to day life to overcome challenges or pick themselves up and keep moving forward. His message is simple and so very important at a time when stress is seen as normal and depression is commonplace. Warren will change the thinking and behavior of your most precious resource, your people. March with Me for Mental Health 2019 is on Sunday 24 March, 2019. Our 6th annual March with Me charity event will be held over one-day where you can choose from a; 60km, 30km, 15km and 5km family event. Bring to life our essence that ‘No one travels their journey alone’ and sign-up as individual or in a team. Along the path you’ll meet other passionate people travelling their own journey – as in life!